Modern email authentication relies on a combination of three standards: SPF, DKIM, and DMARC. These standards help ensure that a message came from a server related to the domain owner and was not spoofed. SPF was the first widely adopted standard for combating email spoofing. Despite its limitations in preventing spoofing, most email recipients expect you to have it deployed on your domain. For example, Gmail/G-Site/Google will throttle incoming emails from domains that do not have a valid SPF record. SPF is defined in RFC 7208. It works by checking for a specially formatted DNS TXT record in the domain of the mail from header in the SMTP transaction. This SPF record describes which servers are authorized to send as that domain by using mechanisms to identify authorized IP addresses and hostnames, or even include the SPF records of other domains. Every SPF record is a TXT record at the root of a domain or subdomain that starts with v=spf1. From there, mechanisms are used to describe mail servers are allowed (or not allowed) to send email as that domain or subdomain. A domain or subdomain can only have one SPF record, but each subdomain can have its own SPF record. Some mechanisms like a, mx, include, and redirect use additional DNS lookups to work. SPF has a maximum DNS lookup limit of 10, including any included records. Any SPF record that would require more than 10 DNS lookups to resolve is invalid! This is a common mistake to make when deploying SPF. To work around this limit, send email from different subdomains. Each subdomain needs its own SPF record and has its own set of limits for that record. For example, you could send newsletters from news.example.com, and invoices from billing.example.com. You might not even need to include every vendor in your SPF records anyway. If the vendor supports DKIM signing, you can rely on that to pass DMARC, even if the sender is not in your SPF record. Just make sure you are using ~all in your SPF record. Describes an ipv4 address or CIDR block of addresses. Describes an ipv6 address or block of addresses. Describes the servers listed in the mx record of the domain. Counts towards the DNS lookup limit. Describes the servers listed in the A and/or AAAA records of the domain. IPv6). If any A record is returned, this mechanism matches. decisions possible at the level of the user and client IP address. A “pass” result means the client is authorized to inject mail with the given identity. The domain can now, in the sense of reputation, be considered responsible for sending the message. Further policy checks can now proceed with confidence in the legitimate use of the identity. neutral A “neutral” result indicates that although a policy for the identity was discovered, there is no definite assertion (positive or negative) about the client. A “neutral” result MUST be treated exactly like the “none” result; the distinction exists only for informational purposes. Treating “neutral” more harshly than “none” would discourage domain managers from testing the use of SPF records. With a “none” result, the SPF verifier has no information at all about the authorization or lack thereof of the client to use the checked identity or identities. The check_host() function completed without errors but was not able to reach any conclusion. A “softfail” result ought to be treated as somewhere between “fail” and “neutral”/”none”. The domain manager believes the host is not authorized but is not willing to make a strong policy statement.Receiving software SHOULD NOT reject the message based solely on this result, but MAY subject the message to closer scrutiny than normal. A “fail” result is an explicit statement that the client is not authorized to use the domain in the given identity. Disposition of SPF fail messages is a matter of local policy. Most SPF records (except for those that are designed to be included in other SPF records) end with an all modifier. The all modifier consists of the word all with a qualifier in front of it. The all modifier states how emails should be treated that do not match any of the listed mechanisms. It is a common misconception that SPF stops email spoofing. At best, it makes things a tiny bit more difficult on an attacker. Remember, SPF checks for an SPF record at the domain in the mail from header in the SMTP transaction (also known as the envelope from), not the message from header that the receiving mail client sees, The SMTP transaction are not visible to the end client, even when viewing the message headers. This means that an attacker can use SMTP headers to direct the target’s mail server to check a domain that the attacker controls, which contains an authorizing mechanism for the mail server the attacker is using, while spoofing a completely different domain for the target to see in the message from header! In the example telnet screenshot below, the attacker is able to get the receiving email server to check the SPF record of a domain that the attacker controls (i.e. infosecspeakeasy.org), while spoofing the target’s own domain (i.e. cincykitchenandbath.com) in the message from header, which is the from address that the target user will see. This sort of domain mismatch occurs legitimately when a mailbox rule forwards a message from another domain. The message from domain will stay the same, but the SMTP mail from header will contain the domain of the forwarding mail server. DKIM signatures on the other hand, are part of the message headers, and survive message forwarding. Therefore DKIM alignment is much more critical than SPF alignment. Once you know exactly which email services legitimately send as the domain (DMARC reports will tell you), update the SPF record accordingly, and change the ?all modifier to -all. This record explicitly authorized any servers listed in the domain’s MX record, while treating all others as neutral. This is a good temporary SPF record for new domains or newly acquired domains that do not already have a SPF record. This must be added to all domains that do not send email, inducing parked domains. DomainKeys Identified Mail (DKIM) is a email message authentication standard, defined in RFC 6376. Because DKIM authenticates the message headers , rather than the SMTP headers, DKIM authentication survives intact when a message is directly forwarded (e.g. via a mailbox rule). canonicalization algorithm: Defines if/how the receiving the receiving mail server should normalize the message to account for slight variations in whitespace and line breaks that could otherwise invalidate the signature. Relaxed mode is strongly recommended for the header and body canonicalization (i.e. c=relaxed/relaxed). Lines in DNS TXT records are truncated at 256 characters. If the record is longer, it must be split into separate lines in the same record in order to be valid. DKIM public key records can be validated for syntax using the DKIM record lookup tool at MX Toolbox. According to the RFC, this tag is recommended but not required, with an implicit default value of DKIM1. Useful for noting which service uses a selector and key. Public key data encoded in base64. Keys must be at least 1024 bytes long. 2048 bit length is strongly recommended. k Key type: Defaults to rsa. Unrecognized key types must be ignored. h Acceptable hash algorithms: A colon-separated list of hash algorithms that might be used. Defaults to allowing all algorithms. Unrecognized algorithms must be ignored. Refer to Section 3.3 for a discussion of the hash algorithms implemented by Signers and Verifiers. The set of algorithms listed in this tag in each record is an operational choice made by the Signer. A colon-separated list of service types to which this record applies. Verifiers for a given service type must ignore this record if the appropriate type is not listed. Unrecognized service types must be ignored.This tag is intended to constrain the use of keys for other purposes, should use of DKIM be defined by other services in the future. y This domain is testing DKIM. Verifiers must not treat messages from Signers in testing mode differently from unsigned email, even if the signature fails to verify. Verifiers may wish to track testing mode results to assist the Signer. Any DKIM-Signature header fields using the i= tag must have the same domain value on the right-hand side of the @ in the i= tag and the value of the d= tag. That is, the i= domain must not be a subdomain of d=. Use of this flag is recommended unless subdomaining is required. The DKIM selector (subdomain) is chosen by the vendor, and is often non-descriptive. You can use an arbitrary string in the n (i.e. notes) tag in the DKIM record to make a note of the vendor’s name, so you know which DKIM key is used by which vendor as you audit your DNS records. randomselector._domainkey.example.com TXT "v=DKIM1; n=marketingco; k=rsa; p=base64Key"
It is generally recommended to rotate DKIM keys once per month, or at least after you suspect that the DKIM private key has been compromised. Most email/marketing services will handle key rotation for you when you configure your domains for DKIM, but some almost never rotate their keys. Unlike web and email certificates, the domain/email address is not part of the PKI. DKIM does not use certificates.. The domain is listed in the d= header tag.Therefore, you do not need a separate public/private key pair for each domain. s1._domainkey.example.com TXT "v=DKIM1; k=rsa; p=<public key>;"
s2._domainkey.example.com TXT "v=DKIM1; k=rsa; p=<a different public key>;"
Third party services will often have you authorize their DKIM keys on your domains using CNAME records, and will then validate that those records exist before signing email, so they can handle key changes for you. If you are using your own keys, it is up to you to manage them, preferably using automation. Start by signing all of your emails using the first selector. When it is time to rotate they keys, sign all outgoing email using the s2 sector. After a week of not using the key at the s1 selector, replace the key at the s1 selector. When it is time to rotate keys again, start using the s1 selector exclusively, wait a week, then replace they key at the s2 selector with a new key, so it will be ready for the next rotation. Unless a key is known to have been compromised, it is important to wait a week (i.e. 7 days) before replacing it, as some receiving mail servers will cache the public key at a given selector for up to a week. Using this ping-pong key rotation scheme, you ensure that email is always signed with a valid, secure key. Without DMARC, the d= value in a DKIM signature header is not required to match the same domain that the user sees in the message From header. An attacker can place a valid DKIM signature header in an email with a d= value that points to a domain the attacker controls, allowing DKIM to pass while still spoofing the from address to the user. Domain-based Message Authentication, Reporting, and Conformance (DMARC) is defined in RFC 7489. DMARC ensures that SPF and DKM authentication mechanisms actually authenticate against the same base domain that the end user sees. In order to be useful, a DMARC DNS record must be published by a domain owner, and email recipients must honor this record, including its enforcement policy, and at least send back aggregate reports if requested by the domain owner. A message passes a DMARC check by passing DKIM or SPF, as long as the related indicators are also in alignment with the message’s From address. DKIM alignment is more important than SPF, because only DKIM remains aligned when a message is forwarded via a mailbox rule. DMARC has two report types: aggregate and forensic. email recipients that honor DMARC send these reports back to domain owners in emails sent to addresses listed in the domain’s DMARC record. There reports contain very useful information for debugging message alignment and identifying malicious spoofing campaigns. DMARC requires domain owners to set a policy (p=) tag in their DMARC record. This policy tells recipients how they should react to an email that appears to come from that domain based on the message from header, but does not pass DMARC alignment. The Domain Owner requests no specific action be taken regarding delivery of messages. Use this first to ensure your messages are DMARC compliant before switching to quarantine or reject. The Domain Owner wishes to have email that fails the DMARC mechanism check be treated by Mail Receivers as suspicious. Depending on the capabilities of the Mail Receiver, this can mean “place into spam folder”, “scrutinize with additional intensity”, and/or “flag as suspicious”. The Domain Owner wishes for Mail Receivers to reject email that fails the DMARC mechanism check. Rejection SHOULD occur during the SMTP transaction. Even if a domain has a DMARC policy set to p=none, mail services may still display warnings to their users in the event of a DMARC failure, as shown in this screenshot of a valid email from a retail credit service, displayed in ProtonMail and Gmail. As an email gateway evaluates SPF, DKIM, and DMARC, it adds the Message-Authentication headers to the email. Users and administrators can use these headers to determine which checks passed or failed, and why. Email headers are added and read from the bottom to the top. First, the server notes that the message has not been DKIM signed. Then, SPF is checked, with a SMTP mail from header value of noreply_[redacted]_portal=[redacted].com__0-28eb251z589s1s@zihu5s1p6odwjt9p.s3cycftqbacrhjk9.hf76qay.3-1ffzneao.na45.bnc.salesforce.com, and SPF passed. A salesforce.com address was used so that Salesforce can keep track of bouncebacks, and avoid sending to invalid email addresses in the future. SPF passed. Finally, DMARC is checked, which fails, because the message is not DKIM signed, and the base of the SMTP mail from domain used by SPF (salesforce.com) does not match the base domain domain in the message from header ([redacted].com). dis=none (short for message disposition) indicates that the message was still delivered, because the mail server noted that [redacted].com has a DMARC policy of p=none. The retail credit service should resolve the DMARC failures by configuring Salesforce to DKIM sign the messages, and then publish the DKIM public key as a DNS TXT record on [redacted].com. DMARC policy records are placed at a TXT record at the _dmarc subdomain. Subdomains of the TLD/base domain automatically inherit this DMARC policy record, or they can have their own record at their own _dmarc subdomain. _dmarc.example.com TXT "v=DMARC1; p=none; rua=mailto:dmarc@example.com; ruf=mailto:dmarc@example.com"
You might not want to include this tag if you are in an industry that sends sensitive information, especially if you are automatically processing reports. This could cause sensitive emails to be saved in ELK or other storage areas if the messages fail DMARC. If a recipient receives an sensitive email that fails DMARC, that email could be sent back to your reporting inbox, and archived in your DMARC report processing tool. Provides requested options for generation of failure reports. Report generators MAY choose to adhere to the requested options. This tag’s content MUST be ignored if a “ruf” tag is not also specified. The value of this tag is a colon-separated list of characters that indicate failure reporting options. authentication mechanisms fail to produce an aligned “pass” result. specific reporting is described in RFC 6651.
reporting is described in RFC 6652. Recipients are only obligated to send reports to the first two rua and ruf addresses. They might not send to any additional address listed. Sets the policy for all subdomains. Setting this tag could allow the spoofing of any arbitrary subdomain. Add a separate policy record for each subdomain as needed instead. In relaxed mode, the Organizational Domains of both the DKIM-authenticated signing domain (taken from the value of the “d=” tag in the signature) and that of the RFC 5322 From domain must be equal if the identifiers are to be considered aligned. In relaxed mode, the SPF-authenticated domain and RFC5322 From domain must have the same Organizational Domain. In strict mode, only an exact DNS domain match is considered to produce Identifier Alignment. A list separated by colons of one or more report formats as requested by the Domain Owner to be used when a message fails both SPF and DKIM tests to report details of the individual failure. Only “afrf” (the auth-failure report type) is currently supported in the DMARC standard. Indicates a request to Receivers to generate aggregate reports separated by no more than the requested number of seconds. DMARC implementations MUST be able to provide daily reports and SHOULD be able to provide hourly reports when requested. However, anything other than a daily report is understood to be accommodated on a best-effort basis. _dmarc.example.net TXT "v=DMARC1; p=none; rua=mailto:dmarc@example.com; ruf=mailto:dmarc@example.com"
How can I check a DKIM signature? Send an email to a Gmail account. They have a nice UI that shows the DKIM status of a message. What if a third party sender can’t support DMARC? Further reading on this problem. How can I get more forensic reports? Often, you will find a service that sends email that passes SPF alignment, but not DKIM alignment, but you might not know which email workflow has the problem, because you won’t get many forensic reports, since at SPF is aligned. Try setting fo=1 in your DMARC policy record. By default, fo is implicitly set to 0. DMARC failure/forensic reports are only sent if all authentication mechanisms (i.e. SPF and DKIM) fail to produce an aligned “pass” result. Setting fo=1 in the DMARC policy record will provide forensic/failure reports if any authentication mechanisms fail. This is noisy, but very useful for troubleshooting DKIM when SPF is passing, Remove the fo tag, or set it to 0 once troubleshooting is complete. LISTSERV 16.0-2017a and higher will rewrite the From header for domains with a DMARC quarantine or reject policy. Reasonably priced, fully DMARC compliant marketing and transactional email. Good option if a full CRM is needed. Extremely cheap bulk marketing email; extremely expensive transactional email. Not as cheap as Elastic Email, but cheaper than SendGrid and Mandrill, with options for SMS. These services use their own domain came in the DKIM d= tag, making the signature unaligned with the message from address domain they are spoofing. To work around this problem, configure the service to use a specific subdomain of your domain in the message from address for example, configure a newsletter to be sent from noreply@news.example.com, instead of noreply@example.com. That way, you can create a separate DMARC record with p=none for the news.example.com subdomain, while still being able the DMARC record for example.com TLD (and all other subdomains) at an enforced policy, like p=reject, when you are ready. _dmarc.example.com TXT "v=DMARC1; p=reject; rua=mailto:dmarc@example.com; ruf=mailto:dmarc@example.com"
These steps aren’t required to deploy DMARC, but they can help to make your email more secure. TLS ensures that messages are encrypted on their way to your mail servers. STARTTLS allows email clients to upgrade from a plan text connection to an encrypted one. Or you can check at https://www.checktls.com/TestReceiver. checkdmarc also checks for TLS and STARTTLS. Brand Indicators for Message Identification (BIMI) is an emerging standard that some mail applications/services are starting to follow (currently only Yahoo, with more services throughout 2019) . When a mail client uses BIMI, it first checks to see if the message passed DMARC alignment. If the DMARC policy is set to enforcement (i.e. p=quarentine or p=reject) and DMARC alignment has passed, the mail/webmail client then checks for a BIMI assertion record at the message from domain. This record points the client to a SVG file publicly hosted on a web server, which is then displayed in the client UI, next to the message from information. To set up BIMI, host a SVG graphic file at a publicly accessible HTTPS URL, then add a BIMI assertion TXT DNS record like this one. Even after publishing this DNS record, your indicator graphic will not display until it has been authenticated that the domain owner also has the right to use the graphic supplied. This is required to prevent a malicious actor from simply copying your indicator graphic for use with a lookalike domain they control. A formalized scalable authentication process is still being worked on. Until that process is established, if you would like to participate in the BIMI pilot, email info@authindicators.org; or if you are a customer of Aguri, Return Path, or Valimail (Who are members of the AuthIndicators Working Group responsible for the BIMI standard), contact their support for more information. Under DKIM required tags I think you meant bh not hb. Hello Sean, first of all I'd like to thank you for your parsedmarc implementation, which is what brought me here. Is there a palce where I could ask for some help about it? I'm trying to test it at my working place, but I can't send properly the results to Elasticsearch/Kibana. I don't want to bother you with trivial questions, because I feel I'm a bit incompetent on this topic. Maybe a community help would be more appropriate. Ok, I've installed everything from scratch using pypy3 3.5 virtualenv (which is currently compatible with Python 3.5.3) on my Ubuntu 18.04.1 server... and everything works just fine. I thinks it's possible that Python 3.6.7 (which comes with Ubuntu 18.04.1) it's not fully compatible with parsedmarc package. Again, thank you very much for this useful tool. As I browse material touting DMARC, it's often mentioned that DMARC allows vendors to send mail without getting flagged as spam. Based on what I've read there and what is hinted at above, is then a requirement for DMARC compliance that a vendor must have DKIM keys from my domain and/or be included in my SPF records, PLUS he must use my domain as his FROM addresses? Trying to figure out what distinguishes a DMARC-compliant vendor from a non-compliant one. I have a vendor who is on the dmarc.io list, but they say they do not support DMARC. Their mail process ultimately puts their own domain in the FROM header, and I'm not sure they can modify this. But as I read it, that will be a non-starter for DMARC regardless of SPF or DKIM. Whao....This is the most extensive explanation of email authentication in one single article. Good work. Question: Which is what lead me here. Can I set my Dmarc policy to reject/quarantine, if I only have SPF and no DKIM (I use GFI which doesn't support DKIM at this time). If yes will this Dmarc record cause my mails to have issues? That said, the DMARC record you describe is monitor only (p=none), so it won't impact delivery at all. Thanks Sean. Was planning to change to p=quarantine but not anymore. Will turn off DMARC totally for now and just rely on SPF only, since i do not have DKIM. "do: Retain headers from the original message"
also referred to the envelope from ("Return-Path"). 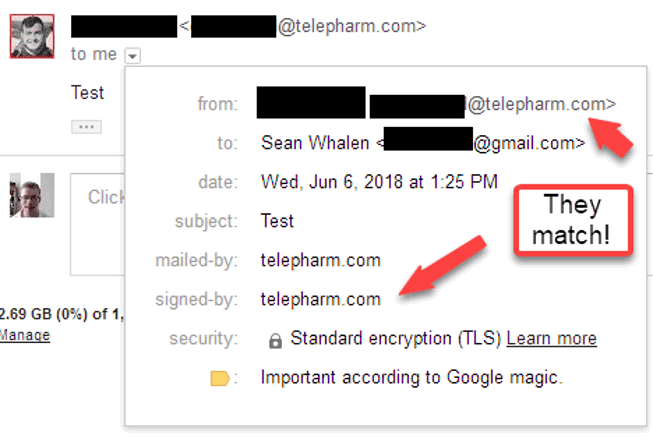 Looking at the article you linked (https://begriffs.com/posts/2018-09-18-dmarc-mailing-list.html) it is not the case. The list is recommended to represent itself as the new return-path. Reading the original article the recommendation was also to "add a Sender header to indicate their relay role". Did you leave this out for a reason or are the suggested setup actually doing so? Even if RFC5322 seems to allow multiple Sender addresses it didn't seem to be valid usage. Adding Sender headers might be bad practice if there is one already (e.g. if an email is sent through multiple layers of lists) and I don't see it as a very useful thing for the recipient either. Would you agree? While commenting I would also mention that "Sean Whalen April 12, 2019 at 3:26 " reply to "Rick Koch" seems a bit simplified. "As long as the vendor can DKIM sign as your domain, their email will work fine with DMARC," relies on the fact that DMARC is ok with either SPF or DKIM passing. The alignment requirement for DKIM is however the header FROM field. "Their mail process ultimately puts their own domain in the FROM header," says Rick and I would say that changes the answer quite a bit. They are in that case not sending emails from Rick's domain at all and they should not sign with his key. Right? It should require them to handle their spam reputation themselves.